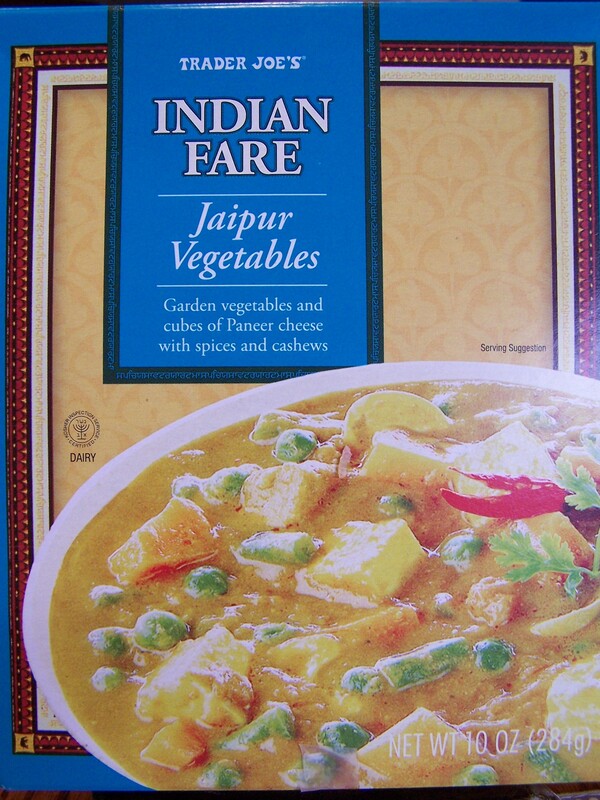 Once you take the plunge and accept that food in a cardboard box that is neither refrigerated, frozen or canned in tin is safe to eat, you’ll like TJ’s Jaipur Vegetables. This is not quite as good as TJ’s Paneer Tikka Masala, but not far behind either. Jaipur Vegetables are a nice combination of potatoes, paneer, green peas, and more, in a mildly flavorful and spicy tomato cream sauce. The flavors are just about spot on. 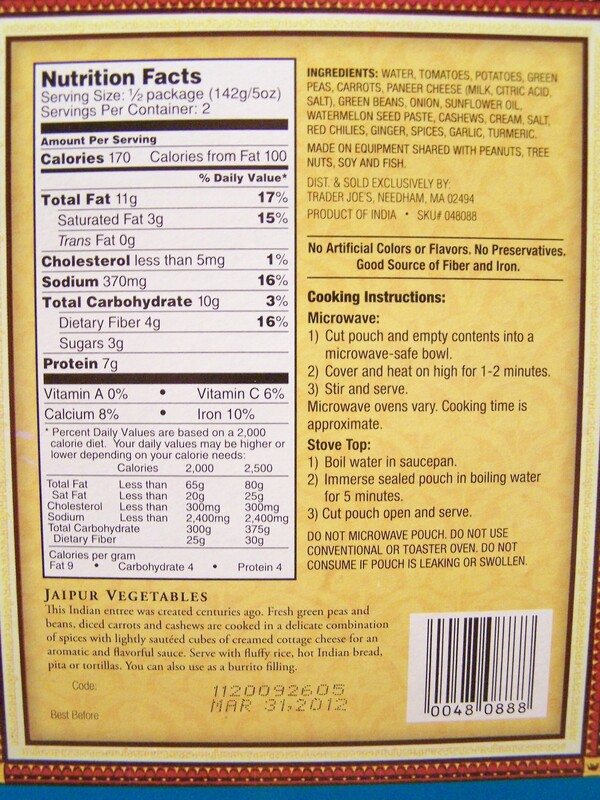 There’s a nice little bite left on the tongue as you enjoy each spoonful of Jaipur Vegetables. The sauce is a little less red than a tomato cream sauce might be, but the flavor is there. One distinct advantage to this meal is, until cooked, it’s stored at room temperature. Inside the cardboard box is an industrial foil and plastic pouch filled with everything you’ll need except a bowl, a spoon and a microwave. This allows you to keep a box or two in your desk drawer at work and avoid the problems of community freezers and refrigerators. Tear open the foil pouch, empty into a standard size soup bowl, heat on high in the microwave for about a minute or two until hot. Give it a little stir and eat. At 340 calories per box (2 servings at 170 calories each) it’s right in line with most box lunches. While the box nutrition facts claim there are two servings in the box, between you and me, you won’t want to share this box with anyone except that very special person (or pet). And when it really comes down to it, you’ll be thinking twice before you look for a second bowl to share. For $1.99, this is also a pretty decent bargain. The really good thing is, sitting next to these boxes on the TJ shelf are a whole lot of other boxes with different meals. If they prove to be as good as this one, there’ll be more to write about soon. While TJ doesn’t indicate this is a vegetarian dish, all the ingredients seem to fit in the category that most people would consider to be vegetarian. This entry was posted on 03/27/2011 at 12:33 and is filed under Recipes, food, cooking and related items, Trader Joe's, Vegetarian. You can follow any responses to this entry through the RSS 2.0 feed. You can leave a response, or trackback from your own site.